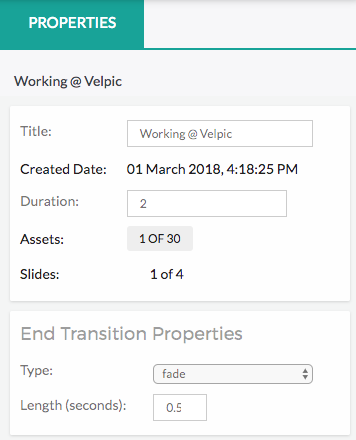 The Properties panel displays information for the current selected slide. Here you will also be able to edit and view the details. Title: The slide name will only be displayed to the editor. Assets: The total number of assets against the maximum allowed. Slides: The slide number within the current module. End Transition Properties: Determine how the slide will transition to the next. By clicking the Pencil icon next to the Module Title, you will be able to edit the Module properties. Module Name: The name of this module will be displayed to users in the menu tab of the player. 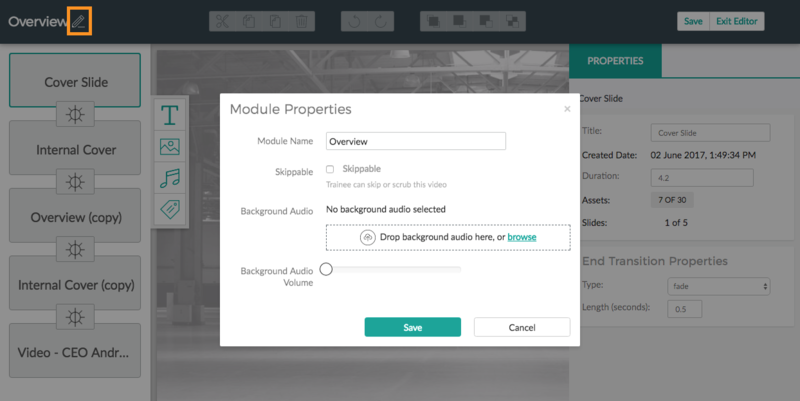 Skippable: Choose whether this particular module is skippable by your trainees. Background Audio: Upload your MP3 file that will be played in the background. Background Audio Volume: Adjust the volume settings to your desired level. Hit [Save] on the Module Properties, hit [Save] again for the Module and Exit Editor to go back to the Module Overview.